Computer Cat, Ed the Invisible Dragon, I'm Wishing and Forty Little Birdies. If you haven't heard of these fun and educational songs by Donna Rhodenizer, you are in for a fantastic listen. Our special guests on the FULL VOICE podcast are Juno nominated children's music performers - Donna and Andy. Donna shares her inspiration and stories about teaching and composing. Donna and Andy share entertaining stories of their adventures touring on the road. A fun and inspiring interview as well as clips of Donna's music, this podcast has many teacher and student take-a-ways! 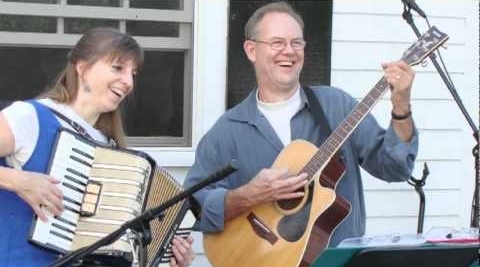 Donna and Andy share their love of fun and music with kids and adults worldwide. Canadian Music Educators Association (CMEA) "Jubilate Award of Merit" recipient Donna Rhodenizer is an accomplished songwriter, composer and music educator. Her song lyrics sparkle with creativity and humour that reflect a writer who has the ability to reach into the imaginations and hearts of children (and their parents!). In addition to performing and recording, Andy is active as a publisher and composer. He often co-writes with fellow performer and songwriter, Donna Rhodenizer. He and Donna co-own Red Castle Publishing, the company responsible for publishing and distributing their recorded and printed music. Together they arrange songs for their own performances as well as publishing their original songs as choir arrangements through the Rhodenizer & Duinker Choral Series. Donna and Andy's attention to lyrical and singable lines for each vocal section makes their music popular with choirs of all ages. Over 30,000 octavos, 5,000 songbooks and 40,000 copies of their CDs have been distributed across Canada, US, Europe, Australia, Trinidad & Tobago and Hong Kong.